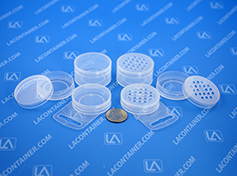 Nucons™ Arts & Crafts Containers for point of purchase packaging and display are available with hang tabs, and lids with holes (shaker tops). 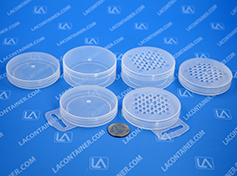 Nucons™ are two piece plastic containers designed for point of purchase packaging. Flush side profile allows for the easy application of safety seal labeling for tamper protection. Available in two different diameter sizes in variable depths, Nucons™ are available with optional holes in the lids and optional hang tabs.